Thanks to the funding and advocacy of tech billionaires like Bill Gates and Mark Zuckerberg, “personalized learning” is one of the “hot, new” trends in education – even though the concept itself is centuries old. Perhaps Socrates-years-old. Indeed, even “personalized learning” as facilitated by machines is neither that new or that innovative. What is new this time around – arguably – is this claim that Silicon Valley invented “personalized learning” just a couple of years ago, that this is something no one has been able to ever do before. That being said, many of the claims about “personalized learning” today echo those long made by the advocates of teaching machines: students will work on lessons that are designed for their precise level of comprehension. Students will receive immediate feedback on their work. They will move on to the next lesson when they each have mastered a topic, not when the teacher’s schedule dictates the whole class move on altogether. 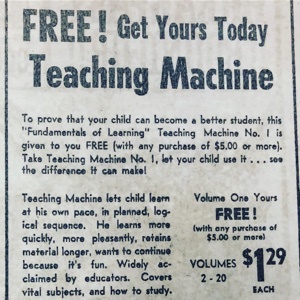 Many of the articles in the popular and academic press that were published a half-century ago in order to make a case of teaching machines traced these efforts back to the ancient Greeks. Stanford professor Patrick Suppes, for example, predicted in Scientific American in 1966 that computers would soon replicate that kind of instruction. 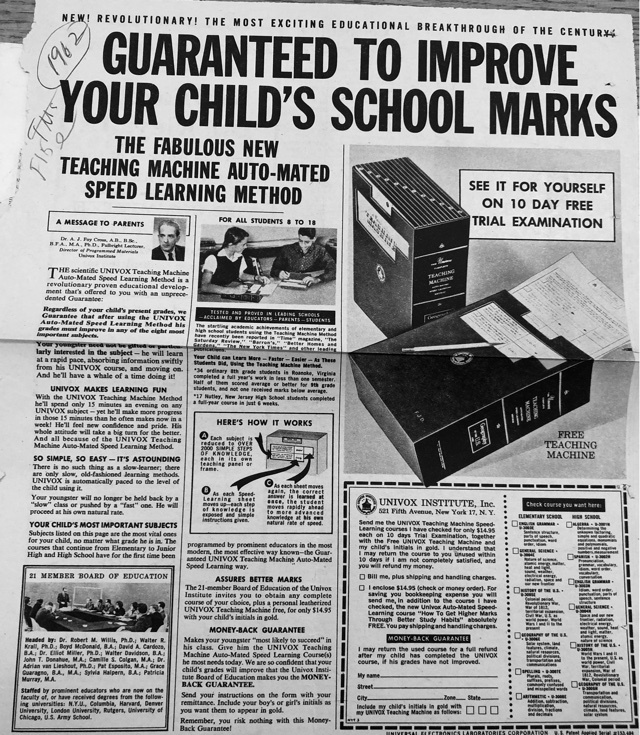 “In a few more years,” he wrote, “millions of school children will have access to what Philip of Macedon’s son Alexander enjoyed as a royal prerogative: the personal services of a tutor as well-informed and responsive as Aristotle.” Instruction by machine would be of the highest caliber; it would be totally individualized. 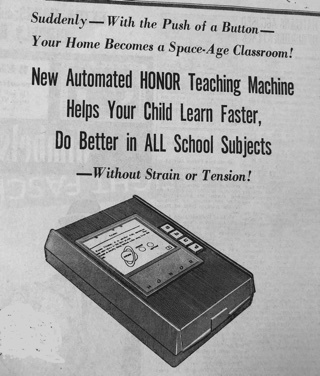 This desire to individualize education – always posited as an alternative to mass education – and this link to the history and the privilege of having a private tutor perhaps points to why teaching machines were often marketed to homes not just to schools. This is how you help your child get ahead. In a post-Sputnik world, one that needs to quickly train men and women (but mostly men) in science and math and engineering, this is how you can get ahead. Image credits: Arizona Daily Star, 1963 (from the Sidney Pressey papers at Ohio State University). The Instructor, 1962 (from the B. F. Skinner papers at Harvard University). Image source unknown (from the B. F. Skinner papers at Harvard University).